Lend a sophisticated but masculine touch to your look with this Miadora men's wedding band. Crafted from highly polished sterling silver, the ring features two rows of silver beaded detailing and shimmering diamond accents, pave-set across the top of the band. 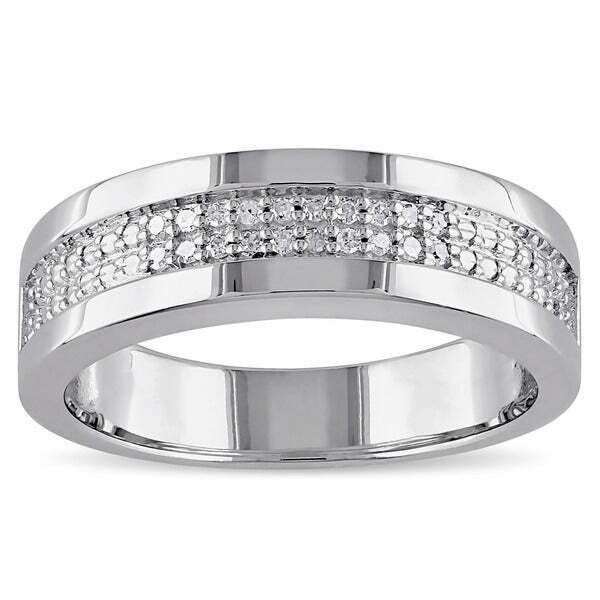 This handsome ring is the ideal blend of simple lines, texture, and shine, for a sleek and elegant look. All weights and measurements are approximate and may vary slightly from the listed information. *T.W. (total weight) is approximate. 1/10 carat T.W. may be 0.08 to 0.12 carat. Treatment code N (White Diamonds). See Treatment Guide for further information. PLEASE NOTE: This ring tends to run small. We recommend ordering one size up when ordering. My husband loves this ring. The size runs adequate. He wears a size 10 and I ordered a size 10 and it fit perfectly. He refuses to take it off. It is lightweight but not cheap or bubblegum machine looking. The diamond chips are glaring like big diamonds and the ring band fits snug and nicely on his finger. Unless you want a more heavier or thicker band this would not be the ring for you. I have seen and he has tried on much cheaper lighter weight bands that cost more and look much cheaper than the price the store asked for the ring. This is a keeper for us. It will do the job! If you are not looking for real cheap looking but a questionable priced look to others when he wears it - then this is the ring for you. I wear nothing cheap - at least it doesn't look cheap. Yes, I would recommend this ring for your future or current husband. TO TOP IT OFF - I ORDER IT ONE DAY BEFORE VALENTINE DAY AND OVERSTOCK OR THE SELLER MADE IT THEIR BUSINESS TO HAVE IT DELIVERED THE NEXT DAY WITHOUT MY KNOWLEDGE. I WAS PLEASANTLY AND SHOCKINGLY SURPRISED!!!! I DIDN'T EVEN ASK FOR A SPECIAL DELIVERY - WAY TO GO OVERSTOCK.COM! Now how cool is that? I Bought this ring for my husband as an upgrade for his wedding band. He Loves it! I highly recommend this ring! I love the diamonds in it and I love the shiny silver color. The ring is okay. I was under the impression that the two rows were all diamonds and they are not. Only the middle are diamonds the rest are silver dots that appear to look like diamonds. very nice men's wedding ring. Nice ring for a good price. My husband has worn it as his wedding band; however, it is small up next to his other rings. So we have ordered a larger wedding ring and I will wear it as a band. It is a nice quality band and looks great! It's a overall nice ring. The silver is not as polish as the image. However the quality is pretty nice. Had it for some time now and none of the diamonds are missing. Although the ring did bend slightly. Beautiful ring!!! I bought this ring as my husband's wedding band and he loved it! The picture does not do this ring justice. 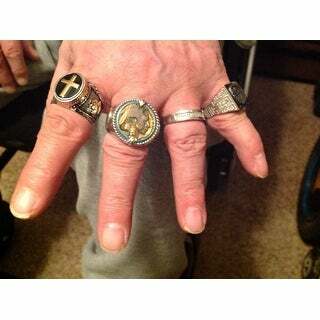 My husband loves the ring! The ring is not to heavy and the diamonds are very nice! Ring looks better in person! This was another great buy thank you overstock! I would recommend this ring to anyone who is looking for an anniversary gift! I hesitated to buy because i thought it would be heavy. I was wrong, very comfy fit and Beautiful Shiny Brilliant like Ring! I lost my wedding ring and this is the closes I have found to my original ring I am happy with it. The ring is more beautiful in person than online! I'm extremely happy and h'll love it just as much as I do! It also compliments my ring perfectly - I'm all smiles. Highly recommend this great deal! Beautiful ring!! My husband gets compliments all the time. I'm very happy with my purchase. It didn't take long for this to tarnish. Not what I expected when I received it. The picture looks better on the website but not better in person. I'm returning this product. It even looks smaller than what I thought it would be. But for my husband as an upgrade to celebrate our five years of marriage looks great. Beautiful ring, fiancé loved it. I love this ring it was a great match to the set I choose. My husband was absolutely amazed that I found this on over stock. My brother in law has order one as well. "could i get this in a size 10?" "MY HUSBAND IS A 9 1/2...WHAT SIZE SHOULD I GET?" "I want to buy this ring but I don't know which size to buy if my partner is size 11.5 "
I bought it for my husband in size, its fits well. "because this is sterling silver will it change color or tarnish dont want him to think i was cheap with his ring"
I bought this ring for my husband as his wedding band. It has not tarnished or changed and he loves it. It's a wonderful ring for a great price. "Can I get this ring in a size 9.5?" No worries it will not change. Very nice ring. "does this ring come in a ring box and is there any paperwork on the diamonds "
Yes a very nice box with paperwork on the authenticity. "Can this ring be adjusted?" Sterling silver rings are unable to be re-sized.